….Diplomats at the time reported that the summit was going very badly and would continue through the night. 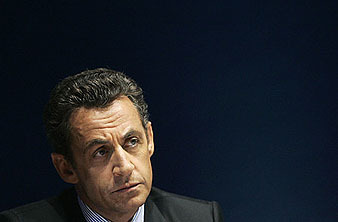 But it ended half an hour later after Sarkozy abruptly announced he was leaving. “Sarko said: ‘For me it’s over. I’m stopping this if we can’t agree,’ ” said a diplomat. I doubt that Sarkozy was even nominally serious about this, but as Megan says, this is a big deal anyway. It shows both that dissolution of the euro isn’t entirely unmentionable and that Germany’s opposition to the Greek bailout was stronger than anyone thought. The former, I suppose, was inevitable, and the latter actually makes it more likely. As Paul Krugman says, it’s hard to think of any other solution to Europe’s problems. Even defaulting completely on its debt wouldn’t really help Greece much at this point. Question: is there any way to artificially “adjust” a country’s exchange rate in the eurozone? I don’t see how, but maybe there’s some clever synthetic way of accomplishing the same thing as a currency devaluation without leaving the euro. Has anyone heard of such a thing?